1) some hardware version information can be found on the fcc id website. 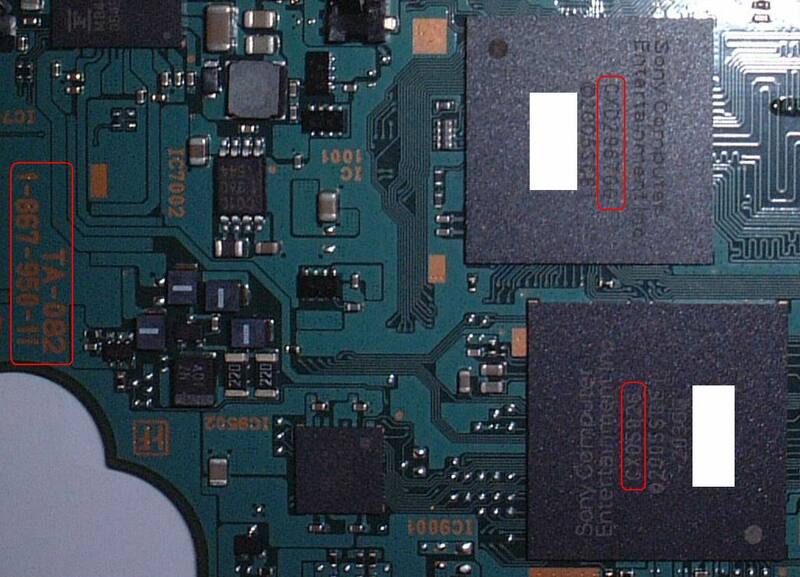 Some FCC ID of the 1001 are AK8PSP1001, AK8PSP1001B, AK8PSP1001B2. There is public available content withe reasonable pictures. AK8 stands for Sony. These numbers indicate at least 3 versions, as far as WIFI is concerned. There are also antenna variations (1 antenna or 2 antenna setup, diff. models) and sub assambly variations. For example a TA-079 mainboard is used somewhere on picture. It might be a prototype for testing only. a TA-081-31 board but with slightly differing cpu/gpu revisions. 3) I noticed on your TA-082 foto that a chip changed from QFP to BGA. It is a medium sized chip close to the cpu gpu setup.IC9502, stamped SC901583A. 4) I did not find TA-082 in the FCC doc's. I hope to be of any help. Keep up the excellent work! A correction: my 1004-F mainboard is TA-081-11, not TA-081-21. Hey Ookm this may be off topic but I'll just ask. I have US PSP core pack, FW2.5 and it's a TA-082 boared. (I think all core packs r the same) anyway with the new downgrader, on your post you did say that the new boared can detect a 1.5 FW and not boot, but did you try it, or is't just speculation, don't get me wrong am not dissing but just can't see how can they block that by changing the boared, I mean were taking out the firmware is there like a BIOS in PC's cuz I thought the FW was the BIOS, anyway am going to try it some time in the upcoming weekend and YES with video proff of (works/or bricks) just to shut the debate. if you have any suggestions I may take or links to someone who did it, then pleas let me know. don't worry got warranty from GAME STOP, so yeah am not crazy. while am at the topic did they fiigure out 2.5/2.6 where you can access kernel w/o GTA, sorry for the long list but thanks anyway. gwc.